I don’t really remember the first time I saw a dead person. Growing up with a funeral home in the family, it just seems like they were always there. Of course, they were always there in their nicely polished casket dressed in their Sunday best. That whole final memory picture of them laying in state really does matter. They look so non-threatening. Just kind of sleeping. I know that she would add in that “we’ll see” as protection. My aspirations were just crazy enough to get some people excited to the extent of curiosity and intrigue. She didn’t want to let them down if I decided after all that the dead weren’t my cup of tea. But it also kind of upset me. Not in a sad way, more in a I-couldn’t-believe-that-she-didn’t-believe-me kind of way. I guess she believes me now. When you go to school to become a funeral director or embalmer, you don’t really get the best cases to work on in the embalming room. Most of the bodies were homeless people who had been dead for weeks. Needless to say, those first few times in school when I saw a dead body in its most pure state, well, that took some getting used to. Have you ever heard of people leaving ‘pretty corpses’? Yeah, well, these bodies were anything but pretty. It’s one thing to see a body in a casket all fancied up. But I thought to myself, why is that? Why is a body is a box normal for me but not a body on a table? It’s because that’s what society has shown us. It’s tradition to go to a funeral home and see a body laying in state. That’s actually pretty normal. People ask me all the time how I do what I do. It’s really simple. How do you do anything? You get used to it, or maybe it just becomes habit. Well, dead people kind of become normal when you work around them all day. Why should I be afraid of them? They can’t hurt me. I can’t hurt them. All I can do is take this dead body and turn them back into a person’s father. Because this dead body isn’t just a ‘dead body’. They are loved by people. They are someone’s family. And sometimes, I still get nervous. One specific example would be if I have to unzip a body bag. It’s just that one minute before the bag is opened when your imagination runs wild. That moment before you know exactly what you have in front of you on your table. But I blame scary movies for these moments. Or maybe I should blame my wild imagination. But don’t get me wrong, I do have my fears. They’re mostly associated with the millions of spiders that decided to make the old Victorian house which is now the funeral home where I’m employed at their home. I don’t know who gives them any rights, but I do know that I hate getting the mail from the mailbox because along with envelopes I’ll pull out at least three spiders. And I hate during the summer months how they all make their webs by the door handles so I have to scream to get into work. But hey, I never claimed to be superwoman. I’m just your average twenty-two year old woman who works with dead people. 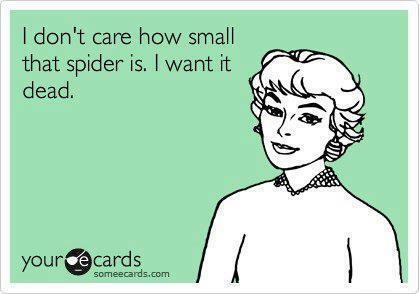 And who is ridiculously afraid of spiders. But I work with men who wear big shoes. And you know what they say about men who wear big shoes, right? They have large feet perfect for squashing spiders with. RIGHT ON. I am terrified of spiders…at least dead people don’t bite you. The first time I heard of a Brown Recluse, I think I almost died. I was once alone in the funeral home and had a gentleman in the embalming room that I had to dress for the next day. I unlocked the door, stepped into the room and saw the largest spider right next to the casket. I calmly closed the door, locked it and decided that I had more than enough fun for one day. I am really enjoying reading your blog and I want to follow you, but I can’t find anywhere to do it…please help! Thank you so much! You’re so kind! Right now I’m using Mozilla and on my computer I can see the follow button on my blog (littlemissfuneral.wordpress.com) on the lower right hand side. Hope it helps and thank you!!! Lauren, as a normal (as normal as it is to want to be a funeral director at our age :)) 24 year old about to start mortuary science school, I absolutely love your blog. This specific post made me feel a little better, because those are the things that I am, not scared of, but nervous about. A body lying in state all pretty and peaceful doesn’t bother me a bit, in fact, that is mostly the reason I’m doing this..(having been through the tragic death of my 27 year old brother last year and experiencing just how big a difference all of you angels that like to call yourselves funeral directors can make in a bereaved family’s life). But seeing those bodies that aren’t so pretty those first few times is what I’m nervous about. It’s nice to hear that you felt a similar way at first, and that you do (mostly) get used to it. Thanks Lauren!! I’ll definitely keep reading!